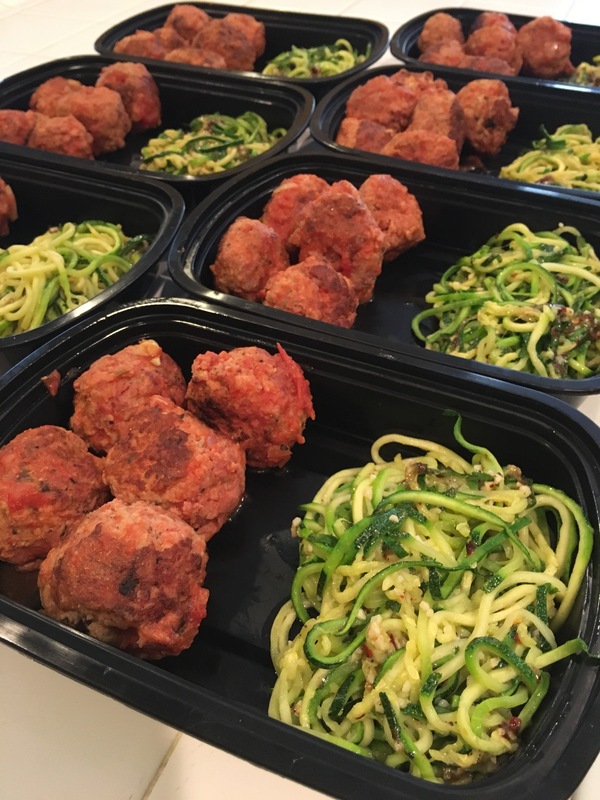 This weeks meal prep is Crockpot Paleo Turkey Meatballs and Garlic Parmesan Zoodles. This meal is full of flavor and really filling! I used a recipe from Pinterest to make the meatballs. Link below. I saw a video on Facebook of the Garlic Parmesan Zoodles and quickly jotted down the steps so I don’t have a real recipe for that but I’ll share what I did. 1. Zoodle your Zucchini (I use a spiralizer). 2. Add Ghee (clarified butter) and chopped garlic to a pan set on medium and allow Ghee to melt. 3. Add Zoodles to pan and cook for a few minutes before adding the shredded Parmesan, tossing Zoodles to help melt the Parmesan. 4. Add salt, pepper and red pepper flakes to taste. Here’s the problem I had…the Parmesan didn’t melt very pretty and was kind of clumpy. I think next time I’ll prepare the Zoodles the same way but only add the Parmesan once the Zoodles are done. The kick provided by the red pepper flakes was perfect! I “plated” the food in my meal prep containers sans tomato sauce and additional Parmesan. I’ll only add those two elements when I’m ready to eat, as seen in this photo above.